Machined from solid brass, AOK Tackle P-Nut Bunker Spoons offer superior casting and great action throughout the water column. AOK Tackle P-Nut Bunker Spoons are machined from solid brass and offer superior casting and great action throughout the water column. 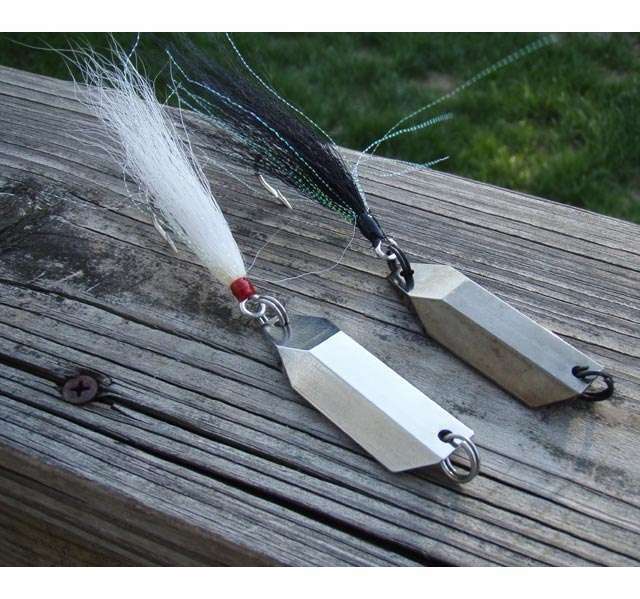 These spoons imitate many of the fuller bodied bait fish such as peanut bunker and butterfish. 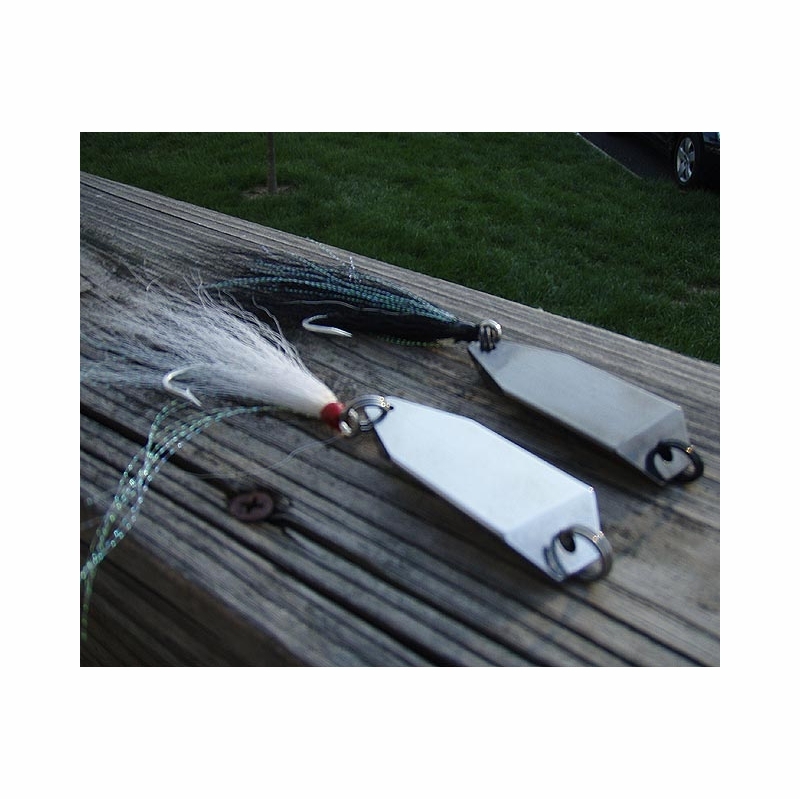 From the Striper Coast and beyond, these metals are a proven winner for striped bass, bluefish, weakfish, fluke, red drum, spanish mackerel, bonito, false albies, tuna and more. AOK Tackle P-Nut Bunker Spoons are available in Classic Chrome and Black Nickel finishes. Key features include Rosco Heavy Duty Stainless Steel Split Rings and Mustad SW Superior Point O'Shaughnessy 5/0 Hooks. Lures casts extremely well. Works well when Peanuts are around and the fish are out far and windy days. Good quality finish and hardware. These things are very well made. I purchased the chrome and black versions and they are both excellent. Casting from the surf is especially good and their movement in the water is smooth and natural looking. They are easy to attach and remove as well. I even used in fresh and water, it attracts fish quickly. ProsVersatile product, it can be used in all types of fishing from the surf or a boat. 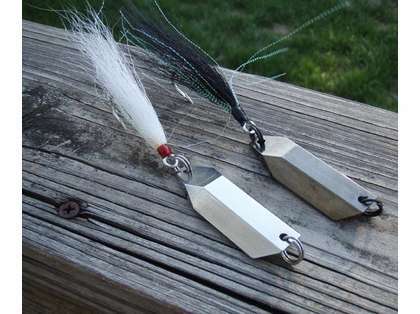 I always add at least one of these in my spread for fall trolling with other spoons. These always produce. Great action and durability. Very productive on Stripers and Bluefish. I have caught some cows on it! This lure casts a mile. I would recommend. Tough fish catching lure with a nice wiggle. Can be worked in different parts of the water column. Cast beautifully. I havent landed a fish with this lure yet but it looks great in the water. the quality seems unmatched. I feel that the brass construction will hold up better than lead, and im glad its not toxic to me. ConsLittle pricey for what it is. Does exactly what you would want it to do. great castability and swimming action. When the waves are crashing and you need a lure that will get down into the zone, the P-Nut tin is a great choice. What is the weight of the spoon?